My friend and writing coach told me once that even when I'm not writing, I'm still a writer. At the time it sounded like a convenient excuse. If someone asked me "what do you do?" I had permission to say "I'm a writer" even if I hardly ever sat at the computer to write. Writer sounds so much better than Facebook junkie. I'm shocked to see I haven't posted anything on this blog since the beginning of March. While I often think about the drafts I have in my saved file, I haven't had the motivation to go back and pick up where I left off. Maybe that's why I dreamed that my father was dead only I didn't believe it. Goes left when you want to go right …. Some of the bloggers I follow have long spaces between their posts, yet there is a flow that lets me, the reader, feel like they were never gone. Like old friends exchanging snail mail. I may not have been writing on my blog, but I did pretty good at keeping up my self-imposed Lenten discipline of writing to a friend every day for 40 days. I missed a few days, but I made it to Easter feeling better for the time spent, not so much in prayer or fasting, as in communication with others. There is something about the act of choosing a card, picking up a pen, writing a note, sealing an envelope, placing a stamp and dropping said letter in a blue box that is more fulfilling than sending an email. 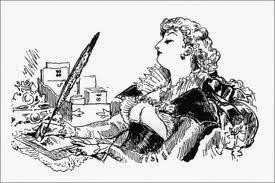 And even if I write a blog with the same intent as I write a letter, the letter carries a personal touch that the blog lacks. Maybe next time I'm asked what I do, I'll say I'm a woman of letters. It has a nice ring to it, don't you think?